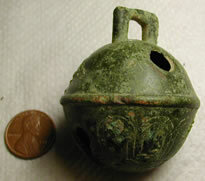 Crotal and rumber bells were used with small animals up to the largest beast.They were also used for by humans as good luck charms, dancing and religious purposes. 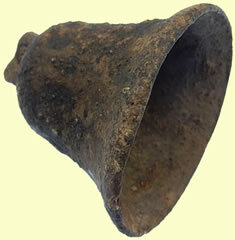 The bells are mentioned in the Bible !! 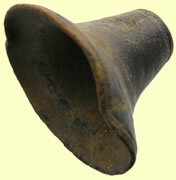 The circular bell is made up of four petal-like tabs folded at the base with a small ‘pea’ inside that is no longer loose. 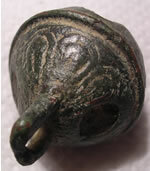 On top is an integral circular attachment loop and decorating the body of the bell, from the attachment loop to the base, are four vertical strips of raised chevron decoration. 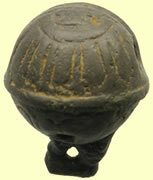 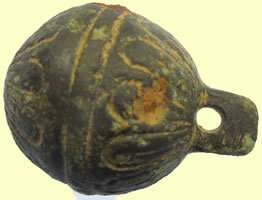 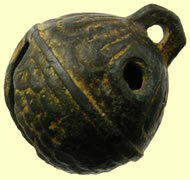 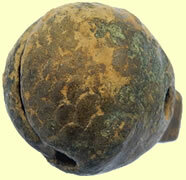 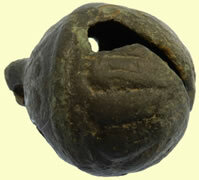 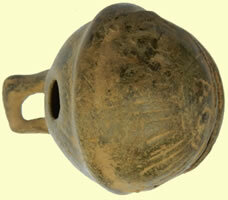 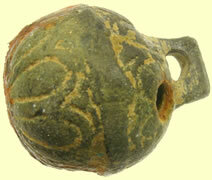 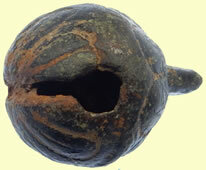 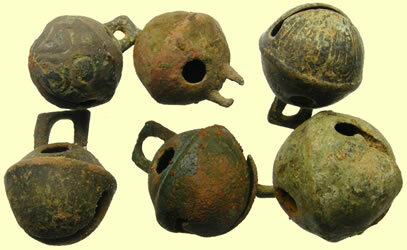 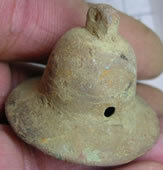 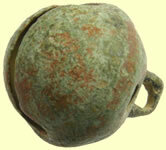 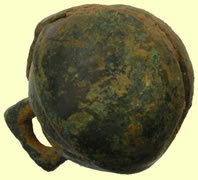 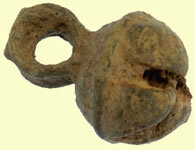 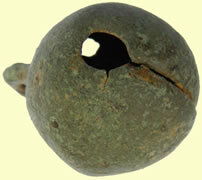 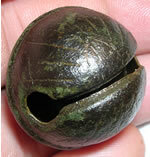 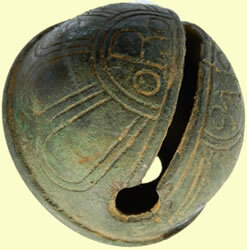 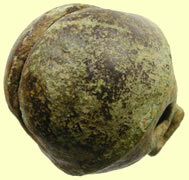 The earliest crotal bells found in England date to the beginning of the 13th century. 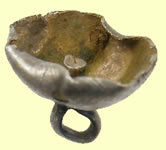 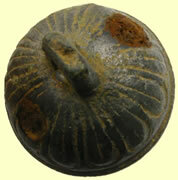 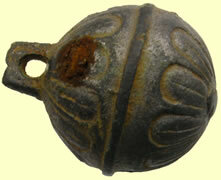 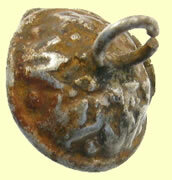 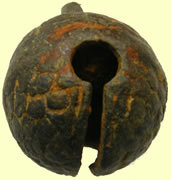 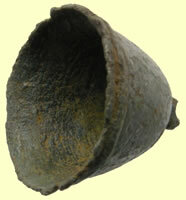 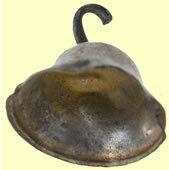 They are of tin and were cast as open bells with an integral suspension loop and four ‘petals’ forming the lower body. 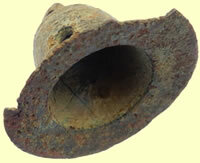 The pellet, also of cast tin, was placed inside the open-ended bell, and the four petals were pushed inwards to meet at the centre and enclose it. 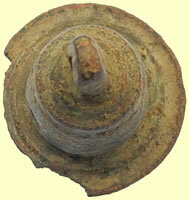 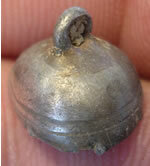 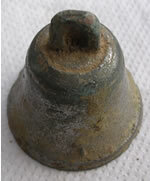 A development that occurs during the late 14th century is the casting of bells in two halves, which were then soldered at the horizontal joint line after inserting the pellet. 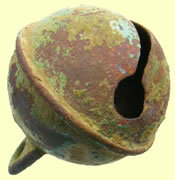 The one-piece cast crotal bell represents a triumph of ingenuity, the manufacturing principle of which has not changed in 400 years. 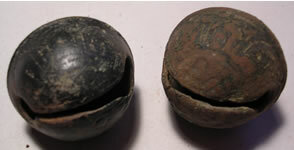 Details of the process, as now implemented, are fully described below, but essentially the pellet is contained within the sand core during the moulding process, thus eliminating the need either to solder a joint, or to bend the body into shape. 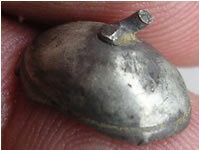 As the method of manufacturing the one-piece bell has changed little since the Tudor period, the determination of their chronology is dependent on differences of detail, rather than basic manufacturing concept. 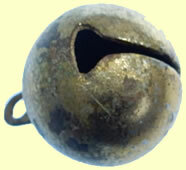 Close dating is often difficult, unless the bells can be associated with a maker whose period of operation is known from documentary sources. 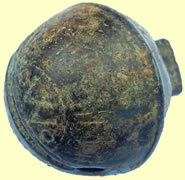 This is rarely the case prior to the late 17th century, when some makers began to put their initials on the bells. 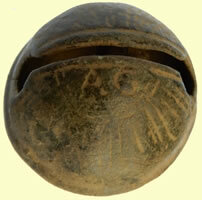 The following details are helpful in determining an approximate date. 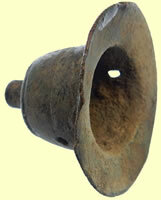 During the 17th century, an innovation in the production process eliminated the need to carry out a drilling operation. 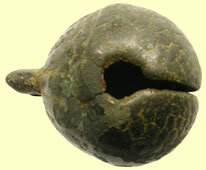 Instead, by making the pattern with a detachable ‘sprue-piece’, it was possible to create a suspension lug with a cored hole. 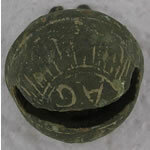 The sand in the upper moulding box was packed around the pattern (see drawing), which was then withdrawn, as normal, from the underside. 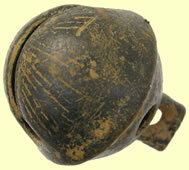 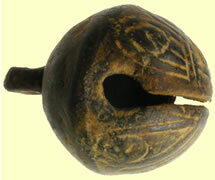 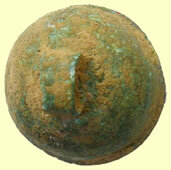 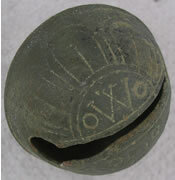 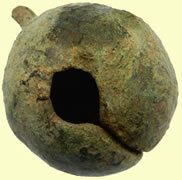 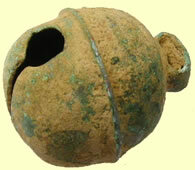 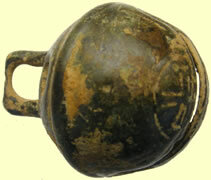 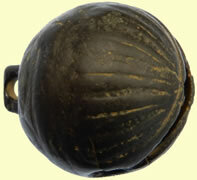 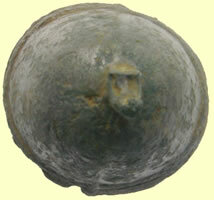 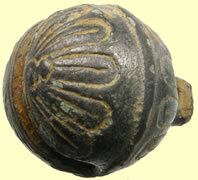 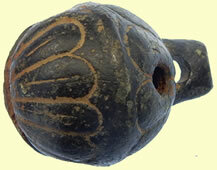 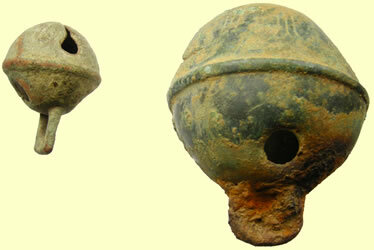 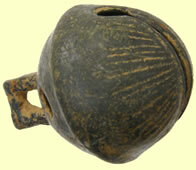 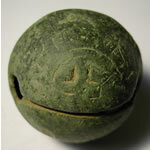 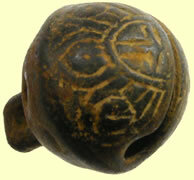 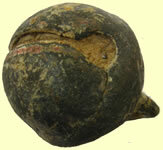 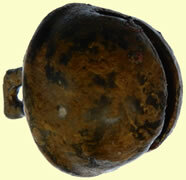 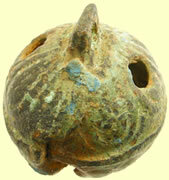 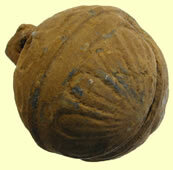 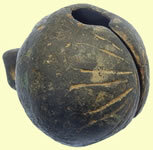 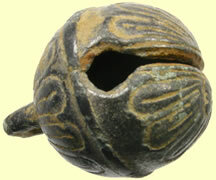 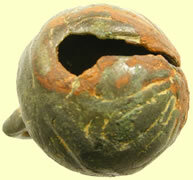 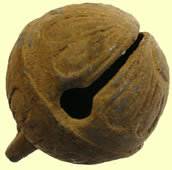 Post-medieval crotal bells may be either plain or decorated, and decoration may be applied to both the upper and lower hemispheres, or to the lower hemisphere only. 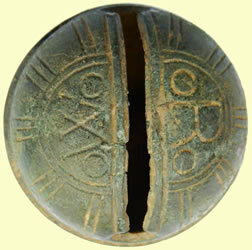 Where both hemispheres are decorated, the respective designs may be of similar or differing types. 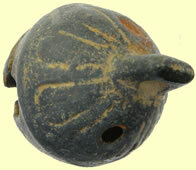 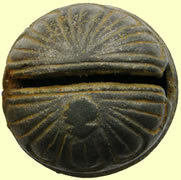 A number of different decorative devices are used, but varieties of the so-called sunburst design (sunflower would seem more appropriate) are by far the most common. 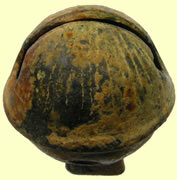 This takes the form of a number of elongated ovoid petals radiating from the centre of the hemisphere. 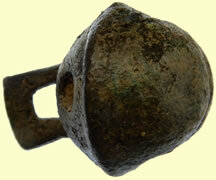 The design is found on bells throughout the post-medieval period. 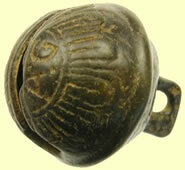 The second most likely form of on both hemispheres decoration to be found is the fish-scale pattern. 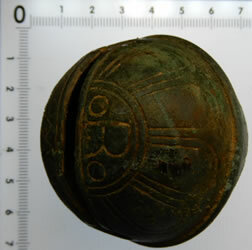 This was used during the early part of the post-medieval period, but is rarely, if ever, found on bells made after the 17th century. 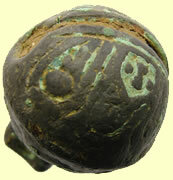 It is often used to decorate the lower hemisphere of the bell, in combination with a sunburst design on the upper hemisphere. 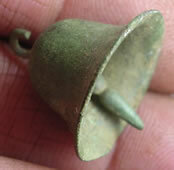 Bells that are decorated only on the lower hemisphere tend to be of later date, usually late 18th to mid 19th century. 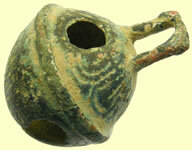 Those with no decoration also usually date to this later period. 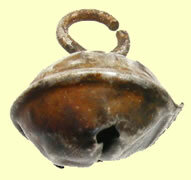 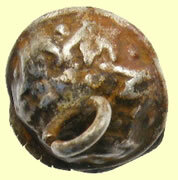 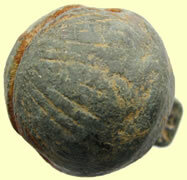 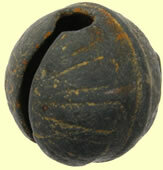 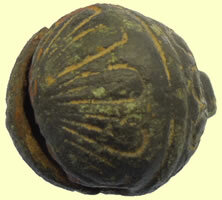 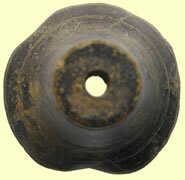 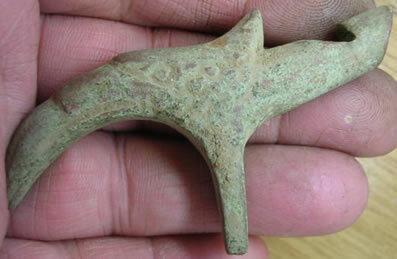 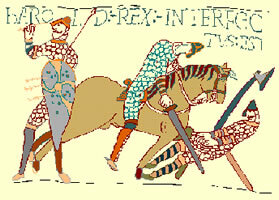 There are, however, exceptions to this general rule, and plain bells of early post-medieval date are also known. 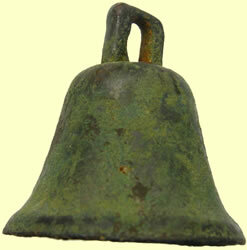 All the indicators discussed should be taken into consideration when dating a bell. 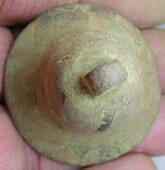 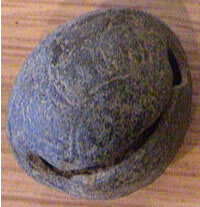 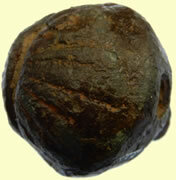 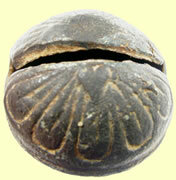 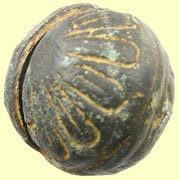 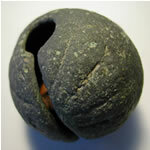 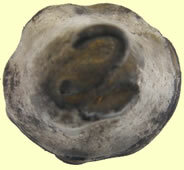 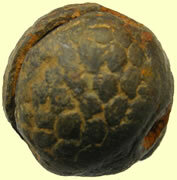 It should also be noted that the decoration can often have a very worn appearance, and is sometimes barely discernible. 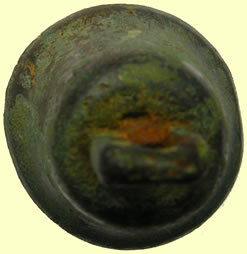 It seems unlikely that such wear occurred in use, and it is probably mostly due to the use of worn-out patterns. 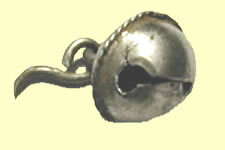 'Acme Whistles made and supplied the original stock of Thunderers for officers and senior ratings of the ill-fated Titanic ocean liner. 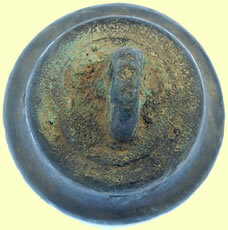 Surviving examples discovered over the years have commanded high prices at auction and generated considerable publicity'. 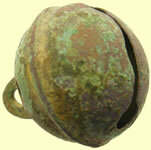 he Wells Foundry was established in 1755 by Robert I (b.1725), the only son of William Wells, a local blacksmith. 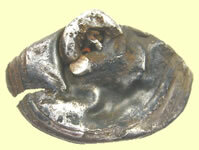 Robert I ran the foundry until his death in 1781, at which time, he was working jointly with his son, Robert II (b.1756). 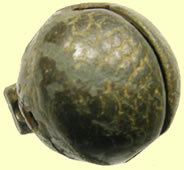 Robert II was joined by his younger brother, James (b.1771), around 1790, and when he retired in 1798, he left James in charge. 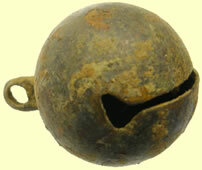 For some time, the business did very well under James, but circumstances changed, and in 1825 it went bankrupt and was sold to Thomas Mears II of the Whitechapel Foundry. 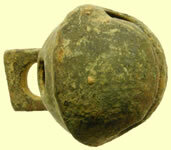 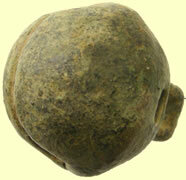 Wells crotal bells are virtually identical to those produced by the Seller Foundry at York. 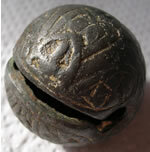 It seems likely, therefore, as Butler suggests, that when Edward Seller II ceased trading and sold his equipment in 1761 and 1763, Robert Wells I acquired his patterns. 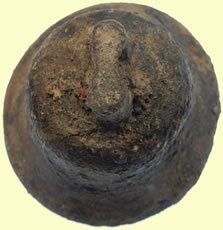 The only initialled crotal bells currently attributed to this foundry are those marked ‘RW’, and these were probably produced even during the period when James was in sole charge. 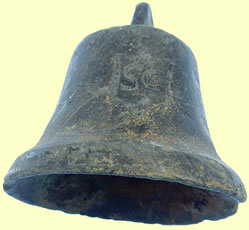 Although details of only one member of this family are listed, the initials ‘WG’ occur on crotal bells that seem to span a considerable period of time and differ widely in quality. 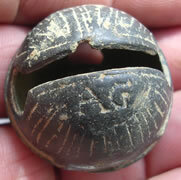 It is possible that earlier members of the family were involved in bell founding, or that the initials on the earlier and cruder bells are those of an unrelated maker. 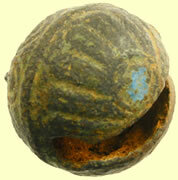 The William Gwynn listed was born in 1749 and died in 1813.